Jan 25 Recipe: An improved method for the production of Guyanan Musa acuminate with Mangifera indica dessert. Recipe: An improved method for the production of Guyanan Musa acuminate with Mangifera indica dessert. 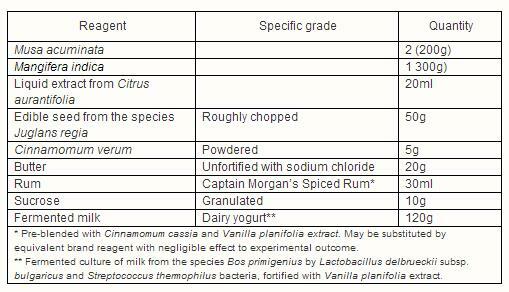 The following describes a refinement of the method described by New Internationalist (2007) for the production of a Musa acuminata with Mangifera indica (common names 'banana' and 'mango') dessert.We hypothesized that the novel addition of a liquid-fat emulsion and seeds from the tree Juglans regia to the admixture would significantly improve both taste and texture. All reagents and solvents (organic grade unless otherwise stated) were purchased from Coop Mega (Lørenskog, Norway). The butter was brought to liquid state (32°C) in an oven-proof pan. The fibrous outer shells of the Musa acuminate and Mangifera indica were removed and discarded. The flesh of the Musa acuminate was divided into sections of 5mm in thickness and the Mangifera indica into 10mm cubes. Both were added to the liquid butter and the temperature was maintained at approximately 75°C for five minutes before the even distribution of caster sugar, liquid extracted from a single sample of Citrus aurantifolia (20ml), rum, powdered Cinnamomum verum and seeds from the species Juglans regia over the Musa acuminate-Mangifera indica. The admixture was incubated at a constant temperature of 200°C for 10 minutes, after which it was allowed to cool to 22°C and served with a culture of milk from the species Bos primigenius fermented by Lactobacillus delbrueckii subsp. bulgaricus and Streptococcus thermophilus bacteria fortified with Vanilla planifolia extract (commonly referred to as ‘ vanilla yogurt’ in the lay literature). The resulting dessert mixture was taste-tested by two healthy, naïve participants (1 female, mean age 29 years). A mixed-methods approach was used. Participants rated taste on a standardised 10-point likert scale (1= ‘Argh! That’s absolutely disgusting’, 10= ‘Best. Dessert. Ever.’), and in-depth qualitative data on the overall eating experience was collected through semi-structured interviews. Mean score for the dessert on the measure overall taste sensation was 7 (s.d.= 1.41; ‘We can definitely have that again sometime’). The present study builds on the methodology described by New Internationalist for the production of Guyanan Musa acuminate with Mangifera indica (commonly referred to as bananas with mango) in their benchmark 2007 publication World in Your Kitchen Vegetarian Recipe Cards (See Figure 1). As hypothesised, the experimental addition of butter and the edible seed from the species Juglans regia was received positively in terms of its contribution to both taste and texture. However, as there was no case-controlled comparison dessert, the additive effect of the seeds remains unquantified. The small size and heterogeneity of the sample population requires that the findings are interpreted with caution. More studies of large populations, in well-defined clinical settings, are required in order to assess both the ease of the methodology described, the tastiness and the suitability of the Musa acuminate-Mangifera indica concoction with other common accompaniments, such as ice-cream.